Select the number of cameras you would like to purchase in this system. You can choose longer wiring, or no wiring at all. Please select below. 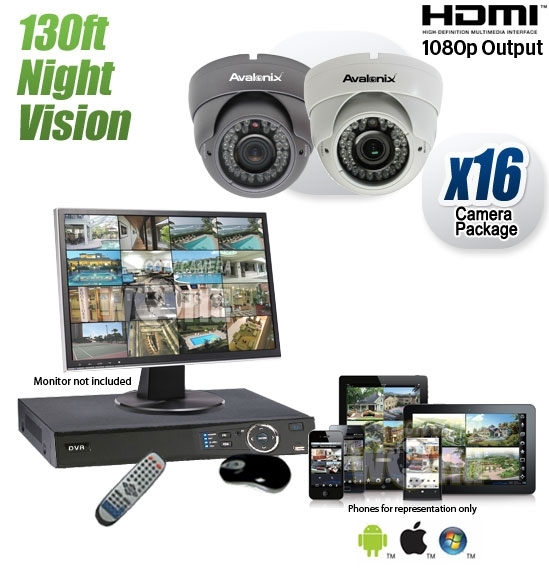 This 16 camera system includes top of the line night vision dome cameras and DVR recorder that offers D1 resolution H.264 video recording, remote viewing and motion detection. This cctv camera system package includes all necessary wiring and power supplies you will need to get the system up and running. The included weather proof dome cameras are great for use indoors or outdoors. They are weather proof IP66 and suitable for use outdoors underneath an eaves. The video quality from these cameras is the best you can get for an analog CCTV camera. The camera has a 1/3" SONY CCD that provides 720TVL resolution video, and there are 36 infrared LEDs that allow the camera to see in darkness up to 130ft. The 2.8-12mm variable or varifocal zoom lens is useful in setting the camera to the right angle of view that best covers your area of interest. The 16 channel mini DVR included in this package is a pentaplex unit that can execute multiple operations without ever stopping the recording process. It provides simultaneous recording, playback, downloading, and remote viewing. The camera system allows configurable recording quality for each camera so you can get the most out of the included 1TB hard drive. You can record 24/7 for minimum of 2 weeks using the included drive. You can use the motion detection feature to prolong recording time, or even upgrade the hard drive up to 4TB. Our systems feature motion detection recording and event notification by email as a standard feature. Using our FREE Apps you can view your system remotely via the internet on your iPhone, iPad, Android device or PC/MAC computer. Backup of recorded video is easy using the USB port to export video to a external USB drive; you can even download video on to a computer over the network / internet. *If you require less than 16 cameras, and would like to purchase the 16 channel DVR, please select the number of cameras you need above. Click on the links above to read more about each component in this system. Our outdoor use cctv cameras feature an IP66 weather rating. The IP (ingress protection) rating is a standard rating of weather protection offered by a camera’s housing. Our outdoor cameras are built to keep out small particles such as dust, and are unaffected by a range of weather conditions including rain and snow. H.264 compression is one of the best video compression algorithms because of its ability to greatly reduce the size of video without compromising quality. All of our security DVR employ H.264 compression that offers unbeatable recording quality while at the same time saving hard drive storage space. Pentaplex or Multiplex operation allows CCTV Camera World's video recorders to multi-task and carryout commands from users without ever stopping camera recording. All of our camera systems allow you to view live video from your system locally or over the internet, playback existing recorded video, or make backups without stopping recording. You can enjoy convenient remote access from your iOS or Android mobile device with our FREE downloadable apps that are specifically designed for our systems. We also bundle every CCTV camera system purchase with FREE central monitoring software for use on a MAC or PC computer. You can monitor your security system from anywhere, at any time. Multiple selectable recording options are available, including motion detection, continuous and scheduled recording. This enables you to choose the appropriate recording type for your surveillance needs and to maximize the number of hours of video you can record and store on your hard drive. The recorder allows still images and recorded video to be offloaded via USB drive or network, for quick and easy backup of your critical video evidence. 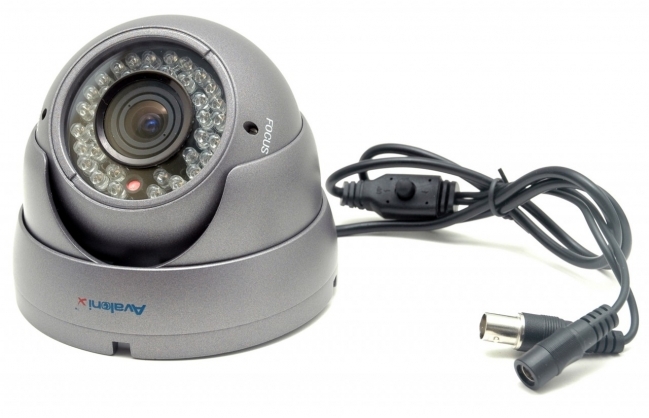 This system comes with video+power Siamese cabling that makes it easy to wire your security camera system. Power and video are transmitted over the same cable, eliminating the need to have a power outlet in the immediate vicinity of the cameras. Simply run the cabling from the camera to the DVR and attach to a power supply located near the DVR. This system is easy to install. Simply mount your cameras in the desired location, run the CCTV cabling that is included with the system back to the DVR. Connect the BNC video connection to the DVR and the power connector to your power supply. It's that easy! Once you install your CCTV system, give us a call and we will assist you in configuring your network router or firewall to allow remote viewing from your DVR. You can also check out our YouTube channel that is loaded with great tutorials and product videos that we made just for you! Do you have a 32 channel security camera kit like this? I like this style of camera. The 2.8mm to 12 mm lens for the camera, does this mean it can be zoomed in or out to suit the location? Is the cabling power/ video in one as normal? does the DVR alarm on movement? You can build a 32 camera system similar to this kit by using our 1080P custom security camera system builder. This camera system contains domes that have a manual zoom lens which can be controlled by hand at the camera. We do have HDCVI motorized zoom dome cameras as well that you can select from the system builder. The sku is MHD2471080W. 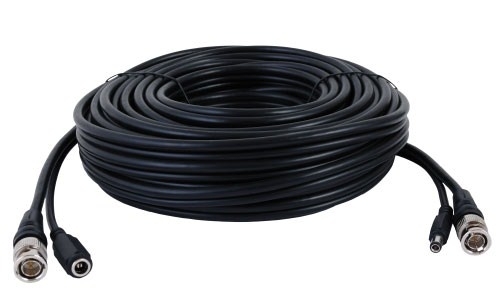 You can learn more about the cabling used in coax based systems by watch the video how to setup a coax security camera system here. Video and power are combined in the cabling. On the same page you will find information on motion detection setup with our systems. Does Google Chrome support of NPAPI plugins On this system? New models in late 2018 are compatible with a chrome extension. You can find more information here.